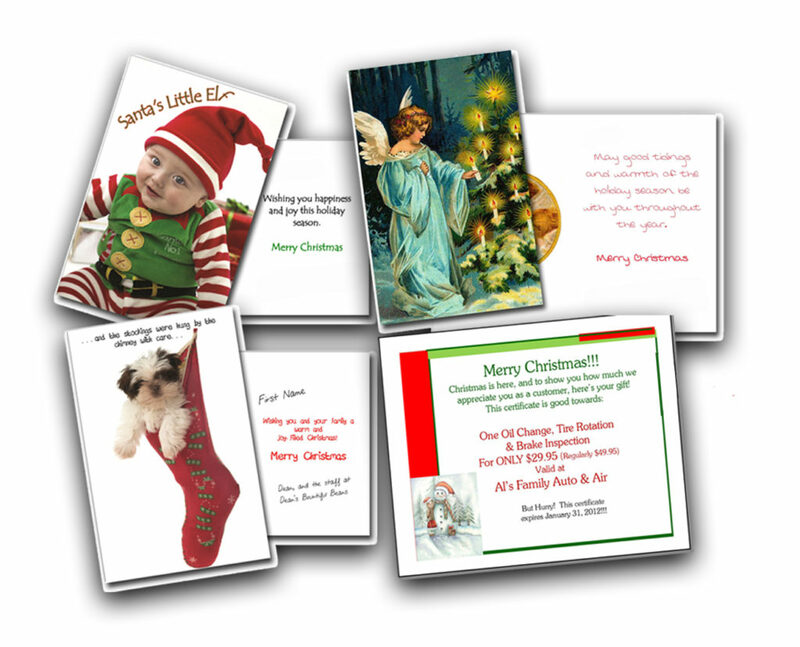 Make your clients feel special this holiday season with our Christmas Cards! Don’t be naughty to your clients… Be nice and keep them for life! Enjoy a stress-free Christmas this year by using our Completely DONE-FOR-YOU Christmas Cards! What makes our Christmas Cards so unique? #1 We use handwritten fonts to personalize your envelopes with both your client’s name and address, as well as your return address. Why? SO YOU DON’T HAVE TO!!! Also, using handwritten fonts makes it look like you took the time to handwrite a special card to your customer. No labels… No generic computer fonts… All at No Extra Charge!! #2 You choose from dozens of Personalized Messages, or create your own! You’re not limited to a standard, cookie-cutter message. Also, we can add your logo and use your own handwritten signature, as well as the signatures of any staff you would like to include. It really looks like your signature because it really is! All at No Extra Charge!! #3 We use colored envelopes, which will stand out from a stack of mail on the table… Guaranteed! Also available, for those who don’t want color, is Traditional White. Plenty of choices to customize your cards the way you want! All at No Extra Charge!! #4 We hand stamp your envelope with Christmas stamps, and you can choose your favorite from what’s available! No red, white, and blue flag, indicia, or presorted stamps. All at No Extra Charge!! #5 We insert your card into the colored envelope, seal the envelope, stamp the envelope, and send them to you ready to go in the mail. It’s all Done-For-You. No staff complaining about stuffing Christmas cards. No cramped hands from writing hundreds of names and addresses on envelopes. Your only task is taking your cards to the post office and dropping them in the mail. It’s that simple! It’s All at No Extra Charge!! If you would like to include a special, separate Christmas Gift Certificate to your customers, we will insert a 5½ x 4¼ certificate into your Christmas card. And guess what? Again… it’s all at No Extra Charge!! Start the New Year off on a good note with a great offer! 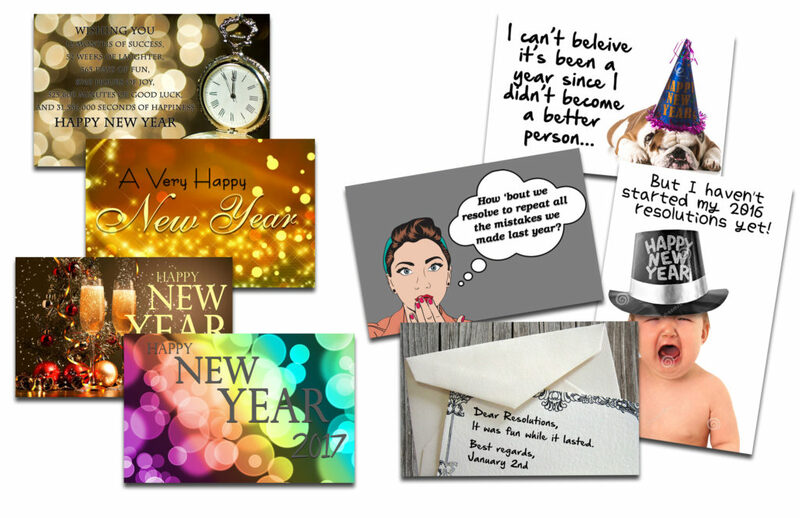 Wish your customers health, wealth and a prosperous 2017 with one of our New Year Greeting Cards. Whatever your message, classic, sentimental or hillarious, we have a card that’s just right for your target market. Throw in an irresistible offer and drive traffic to your business for a double win! Check out the samples below and contact us for details and promotional ideas… we’re here for you! Fill Out the Form Below and We’ll Send You More Info!